Cask; Regular. Also available in pasteurised bottle. In a class of its own, there is no denying the pedigree of this beer. National award winning brewer, Nick Stafford, has created a recipe of subtle bitterness and aromatic finish that will be repeated for generations. This wonderfully smooth drinking beer began life as an 'Autumn Special'. It was immediately the most popular special we had produced. Aroma hops give a delicacy and subtlety to the robust full-bodied flavour. Straw coloured. UPDATED: DEC 27, 2018 Cask at Ascot 2018. Pours a gold colour with a thin white head, plenty of citrus fruits in the aroma, the taste is medium bitterness and fruity with a dry bitter finish. UPDATED: NOV 30, 2018 29/11/2018. Cask at the Dove Winter Beer Festival, Ipswich. Pours golden with a small off-white head. Aroma of fruit, malt, caramel, biscuit and hops. Medium sweetness, moderate bitterness. Moderate body, slight oily texture, soft carbonation. 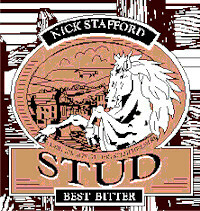 Cask at Spa Hotel, Saltburn-by-the-Sea, as Stud Blonde. Golden blonde colour, white foam head leaving lacing and mellow citrus aroma. Taste is malt, toffee with fruity citrus hop bitterness. Light bodied, soft carbonation, dry papery bitter finish. Quite OK.
Cask as Stud Blond. Pours blond with a frothy off white head. Light fruity aroma. The taste has spice, citrus and hay. Moderate bitter finish. Fine. grass, golden amber with a tiny thin white headtastes like a sherbet lemon thats about to lose its flavour. not unpleasant but not incredible. Bottle from the national brewery centre, burton. Amber beer with medium head. Aroma of malts and caramel. Taste is caramel, sweet malts and a little hop bitterness. Ok bitter. Tasted this in the Salt Cot, Saltcoats (JDW) in November 2013. Cask, handpump dispense. Crystal clear pale amber with a thin creamy white head. Slightly sweet malty note hinting of soft caramel in the short fading aroma. Thin mouthfeel and decent lacing. Pale malt gives a digestive biscuit base with sweet flavours of toffee and satsuma fruit. Very little hop resins detected but there is a vague bitter bite to the aftertaste. Finish is malty with notes of barley sugar and satsuma pith fully present in the mouth. This beer reminded me so much of Otter Ale in taste. An ok session bitter. Cask at The Moon Under Water (JDW), Watford on 8 September 2013. Poured a hazy golden colour with a thin, dishwatery white head. Aroma of toffee, melon and some floral hops. Grassy initial flavour with some peach and pine. Palate is very sugary with some light bitter hops. Uninspired and not very well kept.